It's your big wedding day. Everything has to be perfect. Yet you are missing one thing. Something to keep the celebration going. Pass a deck of personalized playing cards out all the guests and everyone will be delighted to receive these cards tailored to your perfect weeding. Educate our design artists on the bride and groom's names, wedding colors and any other items worth noting and our graphics team will go to work to create you graphics that pop off the playing for the best looking deck of cards. With the high tech printing process we use we can create your playing cards with stunning details in vibrant colors to enhance your wedding dÃ©cor. Every guest will be happy to take home a keepsake from you wedding celebration to remember special day. 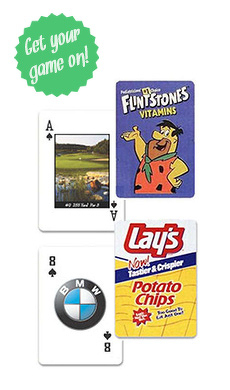 There are many ways to use these personalized deck of cards. Hand them to the guests, have them stacked at the gift table or simply just place them at every table to ensure everyone has a fun time at your celebration.